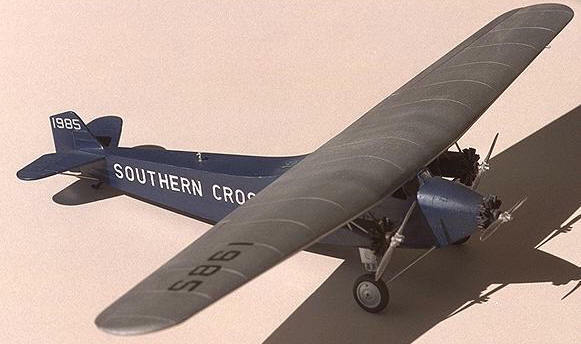 The Southern Cross is undoubtedly one of the most famous of the “Golden Age” record aircraft. First to conquer the Pacific, first to fly between Australia and New Zealand, the blue and silver trimotor captured the imagination of the world with its pilot, Charles (later Sir Charles) Kingsford Smith. Named for the constellation Crux as seen in the Southern Hemisphere, the aircraft had a chequered path to fame – starting out as a polar explorer, and then an endurance flier (whilst Kingsford Smith and partner Charles Ulm attempted their first record flight). Finally named Southern Cross, the aircraft wore several registrations during its life, finally settling with VH-USU painted on her sides and massive slab wing. Scandal as well as success surrounded “the Old Bus” (as Smithy called her), when during a 1929 attempt to fly Sydney-London she force-landed in the Australian outback. A massive twelve-day search for the famous plane and her crew of four followed, finally being discovered by an overflying aircraft. Sadly two searchers perished when their own machine crashlanded, and soon accusations flew that Smithy and Ulm deliberately planned the force landing as a publicity stunt, and despite being cleared the pair’s respective reputations never fully recovered. After her final, failed record attempt (the first east-west transatlantic crossing) in 1930, Smithy flew the Old Bus for joyrides across Australia (surely being the largest “barnstorming” aircraft anywhere!). In 1935 he sold the famous plane to the Australian government, and after his disappearance soon after the machine was carefully watched over by her new custodians. 1944 saw the making of a film about Smithy’s life, and the Royal Australian Air Force recommissioned the aircraft to appear as itself in the picture. At the conclusion of filming she was again grounded, this time for good. VH-USU is now on permanent display at Brisbane’s Eagle Farm airport (where she landed after her triumphant Pacific flight in 1928), in a glass-fronted structure surrounded by Kingsford Smith memorabilia. A faithfully-constructed full-size replica flew for several years in Australia before a landing mishap grounded her, but it is now awaiting an airworthy restoration to grace the southern skies once more. As a long-time fan of Smithy’s legend, and after reading Ian Mackersey’s superb biography Smithy, I finally got myself into a search for a model of the Old Bus. eBay came to the rescue once more! 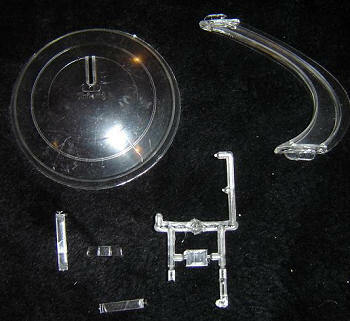 This kit is moulded in fine silver plastic, 37 parts in all (four are very thick transparencies). Overall there’s a fair amount of detail, the three Wright Whirlwind radials especially being superb in my view. 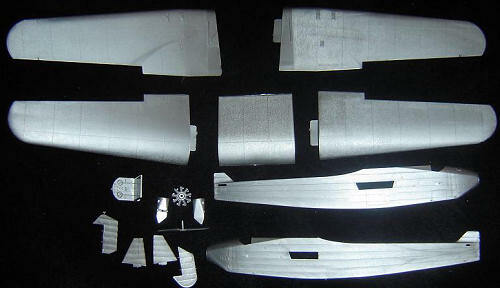 Also of note are the panel lines and detail on the cowl for the centre engine. One notable “flaw” is the lack of a cutout in the wing immediately above the cockpit, but this could be easily fixed by someone keen to. Thanks to Anthony Fokker’s design genius, the trimotor has a massive single-piece wing, and to get by box limitations FROG’s designers came up with a five-piece system for their 1:72 kit – two lower, two upper outer and an upper centre section. The ailerons are separate, so fit may be a tad iffy. The interior is rather sparsely detailed, not really surprising as I believe this kit is 40+ years old! There are four simple seats, grouped closely together up front (the original had a large fuselage fuel tank, behind which the navigator and radio operator sat, leaving only the pilot and copilot up front), and a combined floor/forward bulkhead/control group. This has relief mouldings of two control yokes, instrument panel, and throttle and mixture levers. Mind you, the inside won’t matter too much due to the very thick transparencies, and the small cockpit opening. The horizontal stabilisers are made up of halves, so thickness may be an issue, and the elevators and rudder are separate (allowing for “dynamic poses”, one would suspect!). The tall mainwheels are also in halves, and the mounting struts look very thin but, based on online reviews, they end up being quite strong. The decals in my kit are in surprisingly good condition, and offer one option: the 1928 Pacific flight. So if you’d prefer to do any of her later incarnations I believe you have to make your own decals…..unless some enterprising aftermarket company has some available (call me!). Included decals are the registration 1985 in large, black (wings) and small, white (rudder) font, the immortal Southern Cross titling in white, a pair of white Fokker logos, “DANGER KEEP CLEAR OF PROPELLORS” placards and several small white stars for the forward fuselage. Interestingly, these stars – in the shape of the Southern Cross constellation – are also moulded onto the fuselage, raised! Finally a title decal for the stand is included, with a typo making the aircraft an “EVII” as opposed to “FVII”. The makers apologise for this in the instructions! This being an original FROG issue, the box opens up in the “new” work-tray style, lessening the chance of the Carpet Monster snaffling up your precious parts. Also, possibly again to combat missing parts, a small ticket is included proclaiming “Packed by No.59 – In the event of complaint please return this slip”. A two-piece stand is included, and the hole for this is already open in the fuselage halves. How thoughtful! For someone who grew up on “modern” Airfix, Revell and Monogram kits all these features are quite quaint! Now I know something of what modellers of another generation refer to as “the Good Ole Days”. From what I can gather, this kit has been reissued twice – first by Novo, and currently by Zvezda. I’ve not seen any sprue shots of either so I can’t really comment on any similarity! Well well, what to say? The only moulding in 1:72 of this very significant aircraft currently in existence, which will result in a fine representation of the legendary Old Bus. I don’t measure models against 1:1 dimensions so can’t comment on accuracy, but it looks pretty darned close! The only real negatives in my eye are the sparse interior and the five-piece wing….some filler is in my future, methinks. Review kit found on evil-bay.